When you want plain, simple comfort food just like you remember, this meat loaf is for you. 1. Preheat oven to 375°F. Melt butter in small skillet on medium heat. Add onion; cook and stir 5 minutes or until softened. Cool slightly. Mix tomato sauce and 1/2 teaspoon of the Italian seasoning in small bowl. Set aside. 2. Mix ground beef, crumbled bread, cooked onion, milk, eggs, seasoned salt, remaining 1 teaspoon Italian seasoning and pepper in large bowl. Shape into a loaf in foil-lined 13x9-inch baking pan. 3. Bake 45 minutes. Spoon seasoning tomato sauce over meat loaf. Bake 15 minutes longer or until cooked through. Let stand 5 minutes before slicing.Classic Meat Loaf: Prepare as directed, using 1 cup ketchup in place of the seasoned tomato sauce. Serving Suggestion: Prepare as directed, omitting seasoned tomato sauce. 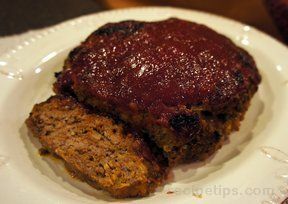 Serve meat loaf with prepared McCormick® Brown Gravy Mix.